The National Council on Aging says every 11 seconds a senior citizen is treated in the emergency room for a fall. Bathrooms can play a big role in that, but you can protect yourself. One of the most practical ways is with products like the ones in our Best Suction Grab Bars for the Bathroom. Its clever attachment allows you to use it anywhere. The Changing Lifestyles Safe-er-Grip 17″ Bath & Shower Handle offers a quick way to add an assist bar wherever you need it. You don’t need to drill holes or mess up any fixtures to attach it. It has 4-inch diameter suction cups on each end. You can use it on any smooth surface that is large enough to accommodate them. It’s a decent value for the price if used as directed. The safety indicator is a welcome feature of this product. 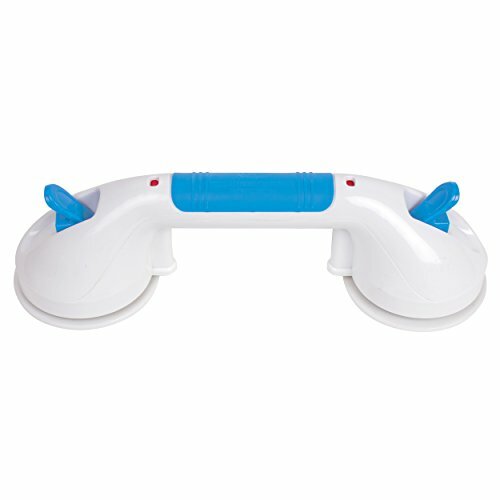 SHOWER GRAB BAR GIVES YOU STABLE ASSISTANCE getting in and out of your shower or bath, and measures 24 inches. The DMI Shower Grab Bar has a red/green indicator to show when it is safely attached to the wall. Green means it’s safe to use, red means the suction isn’t air tight. This grab bar doesn’t require any tools to install and can be moved based on your need and will swivel 180 degrees. The suction cups are 3 inches in diameter, so they’re a bit smaller than the average size. The pleasing design makes it a practical addition to your bathroom. 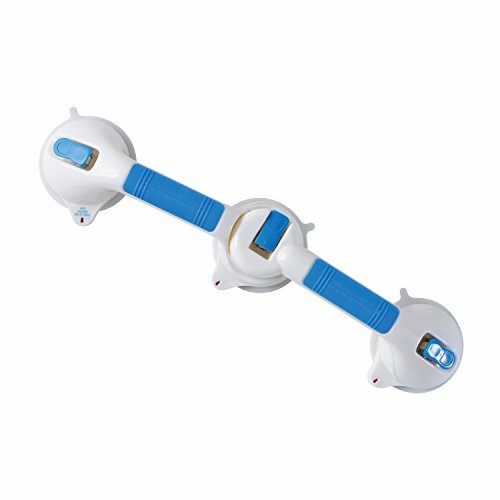 The Moen LR2308W Home Care 12-Inch Suction Balance Assist Bath Grip is another no-tools-required product that can attach where you need it. 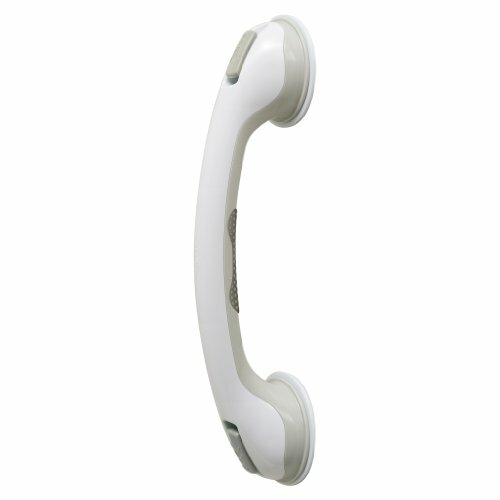 It has a comfortable grip and the bar attaches to the wall with suction cups that are 3 ¾ inches in diameter. It’s best to use for balance instead of pulling yourself out of the shower or tub or up or down from the toilet. It’s a decent value with excellent suction. The Carex Ultra Grip Shower Wall Grab Bar has a safe use indicator that lets you know when it’s installed properly. The suction cups are larger than average at just under 4 inches in diameter. It stays securely in place until you release it. The profile and design are nice though it is the most expensive of its kind. 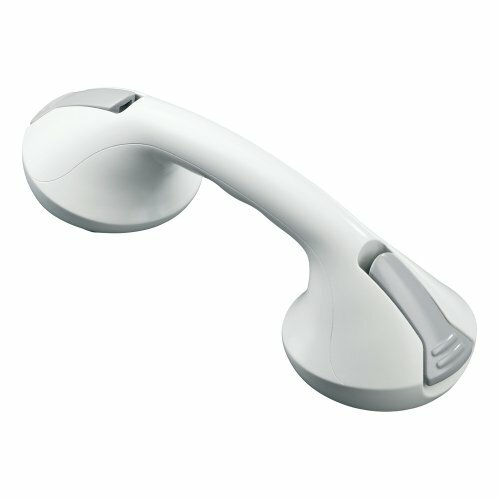 The Drive Medical Quick Suction Grab Bar has two sizes from which to choose. The tabs for installation and removal are a different color than the bar for better contrast. It has a slimmer profile than many similar products. The suction cups are also around 4 inches for better adhesion. Most of the grab bars with suction cups are made with heavy duty plastic. They’re designed with textured grips – usually strong rubber – to keep your hand in place when they’re wet. You’ll find suction grab bars in standard sizes of 12 and 24 inches with some variations, depending on the manufacturer. The swivel ones are an excellent option if you have an odd-shaped space. The other dimension you should note is the height and far it will protrude out from the wall or another attachment area. The value of knowing it is that you’ll have an indication of how easy it is to get a grip on it. If you have larger hands, you should look for a product that’ll give you plenty of room between the grip and the wall. Also, pay attention to the diameter of the main piece if you have smaller hands. It can make it more difficult to get a hold of it if it’s too bulky. Many product descriptions include an image of the suction bar in place to give you an idea of how it’ll work for you. It’s an excellent way to rule out the ones that may give you problems. There are several features to consider when it comes to design. One is the overall shape. Many will have ends that curl down, giving them a more rounded edge. From a design perspective, it softens the lines and makes them appear less sterile and more likely to fit in with your decor. Many grab bars come with textured patterns along the bar to improve grip. You’ll see options from contoured handles to texture to rubber pads all with the same purpose. It’s a matter of preference. It’s important that the suction bar have something to make it easier to grip. The snap tab function is undoubtedly an added convenience and contributes to the overall value of the product. If you travel a lot, it’s worthwhile to have since you can take it with you when you’re on the road. Unless you’re staying in a room with preinstalled grab bars, it’s best to take it with you. Some of the products have a red/green indicator to let you know if the suction bar is securely attached. It’s an added safety feature that’s important to look for when considering your options. Most of the products we reviewed did not require installation making it easy to put a suction grab bars wherever you need it. Because they aren’t wall mounted, they aren’t intended to help leverage your entire body weight and may increase your risk of injury if you try to use them that way. It’s essential when using these types of grab bars that you attach them to surfaces that are clean and dry. They’ll work as described on smooth suraves but may not stick to textured ones since that would leave less space between the suction cup and the wall. Likewise, soap scum will cause a barrier and prevent a good seal. We touched on the overall look of each suction bar as part of our reviews. It doesn’t speak to how well a product will work but instead considers aesthetics of the piece. Again, it treads in the direction of preference rather than practicality. While not a dealmaker necessarily, it is a factor in our decisions with any object we bring into our home. It’s why style was one of the categories we highlighted. The best suction grab bars for the bathroom give you that welcome measure of safety when entering or exiting your shower stall or bathtub. It can help provide a quick way to help you balance as you go about your day. It’s a small, practical way to help you continue to age in place.